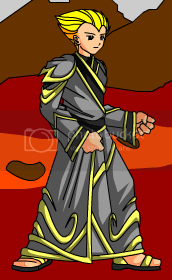 Location: Given to characters who have Student's Robes as their no-drop armor, and then upgrade to Guardian. It can also be semi-permanently swapped in the Guardian Tower by paying 20 Z-Tokens. If you haven't chosen an element, all elements will decrease by round(0.39*PLvl - 0.00107*PLvl^2) %. For more information on elemental relations, see this thread. While you have this armor, Guardian Shield, and any of the basic Guardian no-drop weapons equipped, all your Player attacks and spells gain +2 BTH and deal 102.6% damage. If you have selected an elemental affinity for your no-drop items, your Player attacks and spells gain +3 BTH and deal 103.7% damage instead. This armor follows the Custom Color Scheme you have set for your Guardian Plate. To customize the colors, visit Valencia grumbugly. The robes of the studious elite Guardian! Powers up as you level. Numbers and appendix thanks to In Media Res. Image thanks to feral__john. Write-up thanks in part to Ello. Correction thanks to ArchMagus Orodalf. Costs to change elements correction thanks to Rhowena. Also see Guardian Leather, Guardian Plate, and Guardian Robes. None until Level 40, when the armor grants a +3 BtH on all Player and Spell Attacks. At Level 70, this increases to +5 BtH. You can visit Nimrod in the Guardian Tower to have him set 1 Element to have -5% Resistance at the cost of having +5% resistance to its opposing Element. Info from Kalanyr (via Crimzon5). New Colour Customization location from s4tchel.